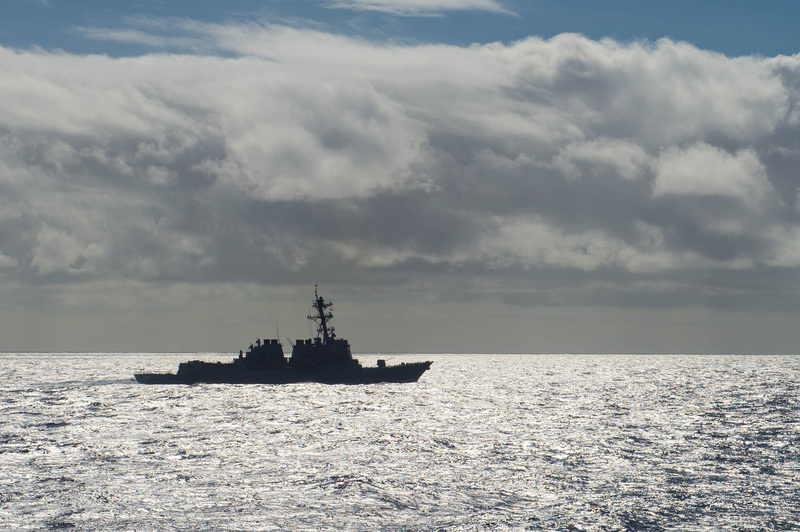 Ten guided missile destroyers will be fully upgraded to Navy’s top-of-the-line Aegis combat system over the next five years — three more than last year’s plan, according to an unclassified fielding profile seen by USNI News this week. Over the five-year future years defense plan (FYDP), the Navy is set to upgrade the Arleigh Burkes guided missile destroyers (DDG-51) to the Baseline 9 standard during the ships’ mid-life maintenance period at an accelerated rate. The full Baseline 9 Aegis upgrade replaces the destroyers’ 1980s era computer systems with modern servers and adds a new signals processor that allows the upgraded ships to not only simultaneously track, target and fire on fighter and cruise missile threats but also interdict ballistic missile threats in an Integrated Air and Missile Defense (IAMD) scheme. The FY 2017 budget funds one full modernization for USS Roosevelt (DDG-80) and two shorter and less expensive for hull, mechanical and electric systems for other ships. In the FY 2016 budget plans, the Navy only planned on conducting one of each availability in FY 2017. The budget request also buys material for five HM&E availabilities and one combat system upgrade in FY 2019, one more HM&E modernization than had been planned. The addition of the HM&E availability in 17 and the three full Baseline 9 modernizations falls in line with the Navy’s larger plan to upgrade the capabilities of its surface ships. The procurement budget supports keeping pace with emerging threats, provides capability to maneuver in the electromagnetic spectrum and maximizes ship service life, according to the budget documents. The Navy will also invest in information warfare enhancements through six Ship’s Signal Exploitation Equipment installations, 16 Consolidated Afloat Networks and Enterprise Services (CANES) installations and 13 Surface Electronic Warfare Improvement Program (SEWIP) block upgrades. These upgrades are among several efforts to prepare the Navy fleet for battle against a near-peer competitor, which service officials said the ships could do today but are on a bad trajectory for staying relevant in the future. “If you ask me about the fight today and can we win against the near-peer adversary? The answer is, absolutely,” Director of Surface Warfare (OPNAV N96) Rear Adm. Peter Fanta said in June to the House Armed Services sea power and projection forces subcommittee. The addition of the ships into a full combat system upgrade is a spot of good news for the surface forces that saw modernizations for DDGs cut over the last two years as bill payers for other programs. 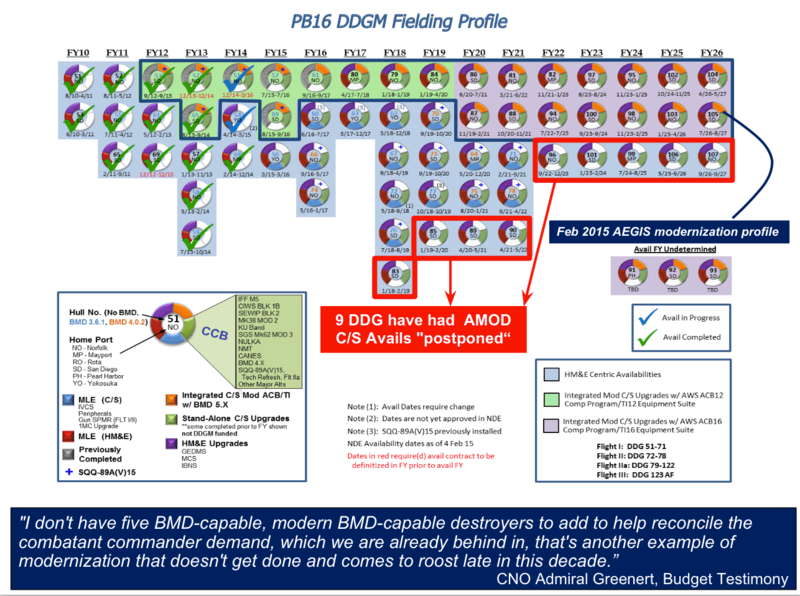 The three Flight IIA Arleigh Burkes (DDG-51) added to the updated profile – USS Howard (DDG-83); USS McCampbell (DDG-85); USS Mustin (DDG-89) – were pulled from last year’s budget submission in an effort to save about $500 million over the FY 2016 FYDP. Sam LaGrone edits USNI News. Megan Eckstein is a staff writer for USNI News.